"God's love must be earned." "God is going to give us everything we want." 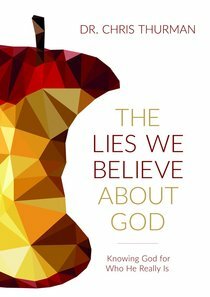 In The Lies We Believe about God, psychologist Chris Thurman explores the influences that affect everyone's view of God, the cost of not knowing God for who He really is, and how knowing God more intimately can bring greater meaning and joy to life. This engaging, biblically rooted book calls readers to see the truth of who God is-truth that can set them free to enjoy a deeper relationship with Him. About "The Lies We Believe About God"
Thurman is a licensed psychologist.